Jacob Balbaugh pitches for Ottawa-Glandorf during Friday’s home game against Elida. OTTAWA — Elida gave Ottawa-Glandorf a grand opportunity to leap back in the game. The Titans certainly appreciated the chance and went on to knock off Elida 7-6 Friday at Memorial Park. Elida led 4-0 after two innings. But O-G scored three in the third, all without a hit. O-G’s Trey Nienberg’s two-out, two-run single down the left-field line gave the Titans the lead to stay 7-5 in the home sixth inning. Nienberg hit a 1-0 pitch off Elida reliever Noah Adcock. Nienberg went 2 for 4 with three RBI on the day. Jacob Balbaugh picked up the victory with two innings of one-run relief. In the seventh, Elida’s Max Parker’s RBI single to short with the bases loaded brought the Bulldogs within 7-6 with two outs. Balbaugh then struck out Alec Ewing on a breaking ball to end it with the bases loaded. O-G is 3-3, 1-1 in the Western Buckeye League. Elida is 4-3, 1-1 in the WBL. Elida ended up with 10 hits and two errors. O-G had only four hits and one error. “This is the way it’s been going for us,” Elida coach Todd Grapner said. “We’ve been given up way too many runs and very few hits. We’re walking guys and not making plays. Neither starting pitcher was around at the end. 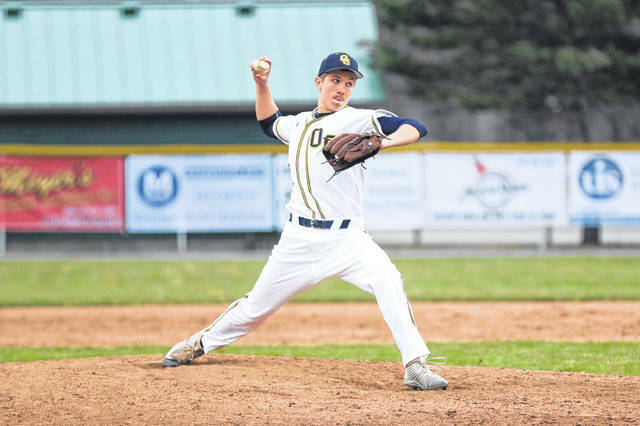 O-G starter right-hander Jaxon Buddelmyer went five innings and gave up five runs, all earned, on seven hits. He struck out five and walked two. Buddelmyer threw 89 pitches, 55 for strikes. Elida starter Brayden Lybarger started the day with two 1-2-3 innings. But back-to-back infield errors led to three unearned runs. Lybarger went 4 2/3 innings and gave up four runs, one earned, on two hits. He struck out six, walked five and hit a batter. He also threw three wild pitches. Lybarger threw 94 pitches, 57 for strikes. He had a no-hitter until two outs in the fifth, when he gave up his first hit, a line-drive single to right by Ethan Alt. “Ethan Alt broke up the no-hitter and that kind of took the weight off our shoulders,” Miller said. Elida went out a 4-0 lead in the second. Mike Niebel walked with the bases loaded to make it 1-0. Adcock’s two-run double push the Elida lead to 3-0. Gunnar Kuhn’s RBI single gave Elida a 4-0 lead. The key inning was the third for O-G, when it had two runners reach on infield errors and were issued three walks. O-G scored two in the third on wild pitches and one came on an RBI groundout by Grant Hovest. That brought O-G within 4-3. Lybarger’s RBI double in the fifth gave Elida a 5-3 lead. Nienberg’s RBI single in the fifth cut the Bulldogs’ lead to 5-4. In the sixth, Elida reliever Adcock struck out the first two hitters. He struck out the third hitter, Hovest, but Hovest reached first on a strikeout/wild pitch. Adcock then walked Wes Davidson and Logan Miller singled to third to load the bases. Alt walked with the bases loaded and the game was tied at 5. That set up Nienberg’s game-winning, two-run single down the line. For Elida, freshman Kuhn was 2 for 3 with an RBI. Lybarger was 2 for 3 with a double and an RBI. Ewing was 2 for 4. This entry was tagged Elida, ottawaglandorf. Bookmark the permalink.